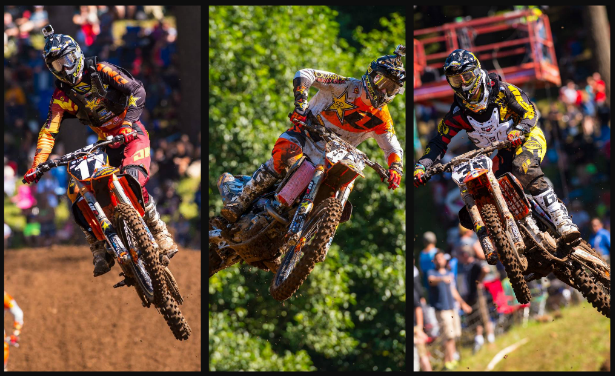 Round 9 of the 2014 Outdoor Motocross Nationals was held at Washougal MX Park in Washougal, WA. In the days leading up to the event, the area received some pretty heavy rainfall. The track crew did an amazing job and the result was some of the best conditions for professional racing seen at the track in recent memory. It was very rutty and rough continuing with what seems to be the theme this year. Joey Savatgy handled the conditions very well showing that his marked improvement and top ten finish from a week ago was not a fluke. He simply rode incredible in qualifying practice. Joey surprised everybody when he managed to put in the 3rd best qualifying time in the 2nd practice which was also the faster session for everybody. In both motos Savatgy put together commendable performances. Good starts and mostly consistent laps throughout. The goal for the past several weeks was to just improve and try to put his KTM into the top ten. After the past couple weeks however, if he just limits his little mistakes, he will be vying for the top 5 for the last 6 motos of the season. Joey Savatgy: "Day was good. I qualified really good and for once I'm learning. Both motos were pretty good though. 1st moto I got a good start but then made a few mistakes the first couple laps and some guys got around me but I ended up 6th that moto. The 2nd moto, had another decent start and I made some passes. I was on [Dean] Wilson for a while but I tweaked my ankle a bit towards the end of the moto and he got away. All in all, good day." Jason Anderson was quite simply flying in the 1st 250 moto of the day. He was moving past his toughest competition and making his way forward to another moto podium finish. A place where he has become a regular as of late. Then as he was closing in on 2nd place, the rough track reached up and bit him. In an extremely fast section, he landed off a jump and hit a rut or bump that he did not see. The result was Anderson swapping and slamming straight into the ground with tremendous force. Luckily he was eventually able to get up and ride back to the pits. He decided with the team that it would be wise for him to skip moto 2 and just heal up and be ready for the next round. Jason Anderson: "The first moto was going real well and I worked my way into the top 3 and was catching [Blake] Bagget. I ended up going down really hard and I'm pretty beat up. We decided it would be best that I sit out the second moto and just go home and focus on Unadilla." Ryan Sipes also opened eyes with his qualifying position. He put in a lap time good enough for 5th place in the 2nd practice and 6th overall. That's pretty much where his day stopped going so well however. In the first moto, he got a bad start, then basically never really got going. He engaged in battles with other riders and it prevented him from just moving past them and making his way forward. After the moto, he went back to the truck and got himself fired up for moto 2. Then as the 30 second board went up, he could be seen waving his arms on the line for his mechanic. Something was wrong with the bike and he was unable to even start the 2nd go around. Ryan Sipes: "Washougal was up and down a little bit for me. I had good qualifying and I felt really strong on the bike. The first moto I just didn't really get a good start and never settled into my pace. I kind of got stuck in everybody's pace around me never really moved very far forward. I was kind of bummed about that and I wanted to make it right for the second moto but we had a bit of an issue with the bike. I'm healthy though and ready to roll for Unadilla." The Rockstar Energy Racing squad will now have a weekend off before heading all the way back to the opposite coast to New York. Savatgy will just want to keep doing what he's been doing and focus on the top 5. Anderson will use the weekend off to recuperate after his big crash and his goal will still be to win his first ever outdoor overall. Sipes will head home to Kentucky to train and be ready to shoot for his first top ten overall this season.